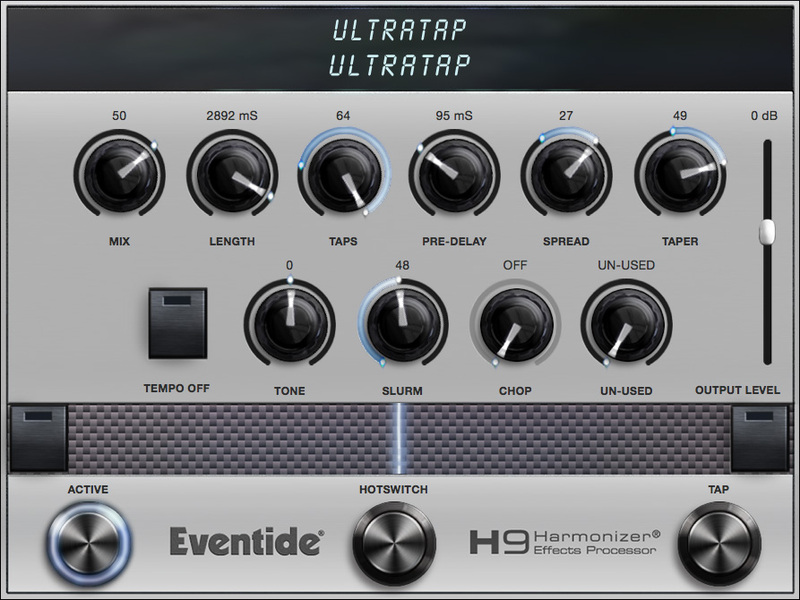 UltraTap is a versatile multi-tap delay-line effect capable of a myriad of sounds from rhythmic delays, to wacky comb filtering, to huge pad-like volume swells, to unique reverbs, and everything in between. Total time over which the taps are spaced in, up to 3 secs of tap time. The number of taps, from 1 to 64. The amount of time before the taps start, up to 2 secs. The rhythmic spacing of the taps. More negative values will group taps towards the beginning, for a “slowing-down” feeling. More positive values will group more taps towards the end for a “speeding-up” delay sound. A zero value will result in constant spacing. Controls the fade of the taps. More negative values will increasingly give a fade-up over the taps, and more positive values will give a fade-down over the taps. A zero value will result in equal gain across all taps. A tone control. Negative values will make darker sounding taps, while positive values will make brighter sounding taps. Juicy tap slurring/smearing and modulation. A pre-tap-machine “chopping’ tremolo OR auto-volume processor. The tremolo has several LFO waveform choices: off [OFF], triangle [TRIANG], sawtooth [SAW], ramp [RAMP], square [SQUARE], or sample/hold [SMPHLD]. The auto-volume processor will either do volume swells [SWELL (0-9 input sensitivity control], or a gating effect, called Trigger, that chops off the end of sounds [TRIG (0-9 input sensitivity control)]. There is also a setting for expression pedal control of the pre-tap-machine volume [EXPDL]. This knob acts as a multi-function parameter control for the [CHOP] knob. For the LFO waveforms, [SPEED] will change the LFO speed. For [SWELL], [RISE] will adjust the swell rise time, and for [TRIGGR], [RELEAS] sets the amount of time after triggering before the gate kicks in and chokes off the sound.